Peggy Duquesnel has co-produced her 8th recording and her first pop / vocal EP working with the legendary talents of keyboardist Jeff Lorber, and Yellowjackets' bassist Jimmy Haslip, together they have produced and infused this music project with outstanding musicality. You will enjoy a taste of jazzy pop, funk, sweet ballads and Latin arrangements that showcase four of Peggy's original compositions and the Carpenter classic 'Rainy Days and Mondays." 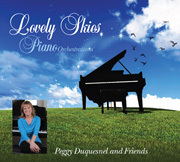 "Pianist/vocalist and composer Peggy Duquesnel releases a 5 song EP here that mixes gentle pop and jazz with some of the best L.A. cats around. Along with Jeff Lorber/keys, Jimmy Haslip/bass, Rick Braun/trumpet-flugel horn, Michael Thompson/guitar and a collection of background vocalists and drummers, she displays excellent depth in lyrics about intriguing aspects of relationships. Her warm and reassuring voice gently glides over the title track, while a funky feel permeates through 'When I Think of You' and 'Bird on a Leash' (which also features some nice horn work by Braun). Duquesnel continues to move forward in presenting music gentle on your mind." "This project is a thoroughly enjoyable offering, and if I wore a hat, I'd certainly be taking it off to Peggy and friends. High marks for arrangements and production as well." "With mad skills and a great attitude, Duquesnel is a stock whose arrow is pointing straight up. Duquesnel has some killer skill sets as a contemporary singer songwriter and along the way has got to know the great Jeff Lorber and Jimmy Haslip for co-production help in Seems Like I Know You. Peggy Duquesnel wrote or co wrote four tunes including the the first radio single 'When I Think Of You' which is a little R&B kicked up a notch with horn powered depth of Rick Braun on trumpet and flugelhorn. From a vocal standpoint think 'Sunday morning jazz' and you have Peggy nailed. Another gem from this release includes 'That's How It Aways Goes' with Haslip's bass turning a melancholy sonic sea into an optimistic adventure with the closing tune in a tasty cover of the Carpenter's 'Rainy Days and Monday'' Duquesnel has a voice as smooth and easy as Sunday morning coffee and the talents of Lorber and Haslip certainly speak for themselves." "One truly admirable piece of art.Relaxing and exhilarating at the same time, Duquesnel is a double threat. She can either nab you with her gentle vocals or her suave and competent work on piano. The magnetism of the subtle and well-arranged finale 'Bird on a Leash' is, at once, seductive and classy with Lorber on guitar and Braun's trumpet complementing the vocals and piano of Duquesnel. Lorber co-wrote track two, 'When I Think of You,' with Duquesnel, a light and snappy number featuring Duquesnel's serene vocals, Lorber on guitar, the smooth soothing groove of guest trumpeter Rick Braun, and the thick runs of bassist Haslip. The cover of the 1971 Carpenters melodically sweet tune 'Rainy Days and Mondays' shows off Duquesnel's vocals and piano skills handsomely. "